You are currently browsing the tag archive for the ‘Auditorium Theatre’ tag. 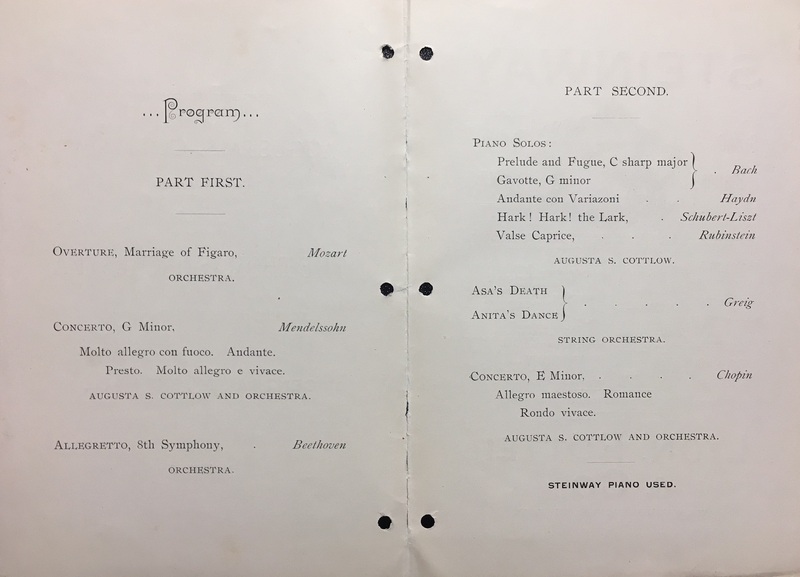 The surviving programs from the Chicago Orchestra’s first seasons’ tours show founder and first music director Theodore Thomas’s enthusiasm for promoting talented young women at a time when it was still rare for them to appear as instrumental soloists. 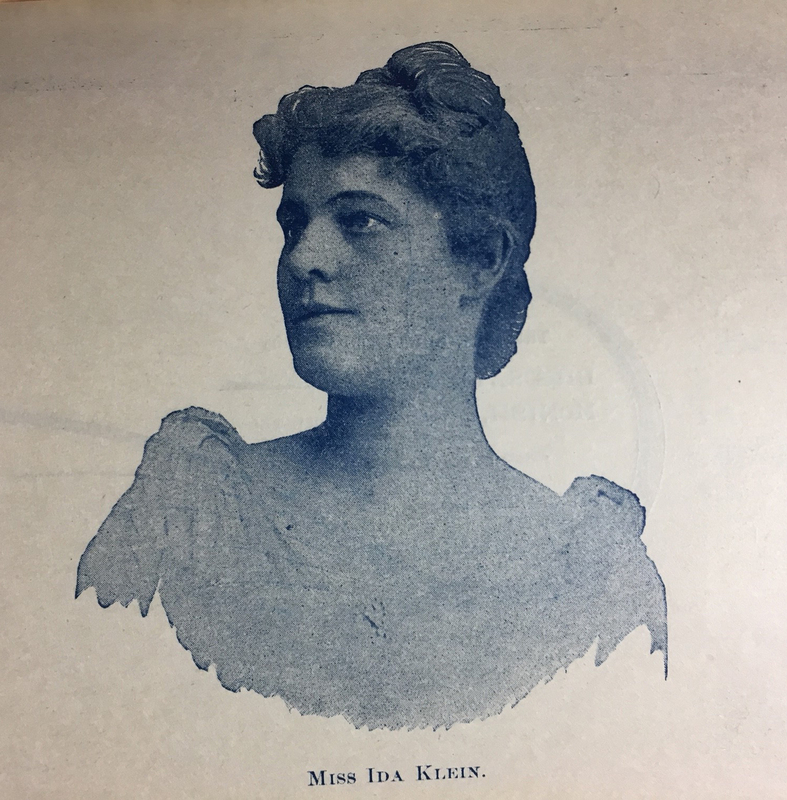 Vocalists appeared regularly, and during the 1891-92 season, Katherine Fisk, Ida Klein, and Christine Nielson traveled with the Orchestra, singing a mix of operatic and popular repertoire (a common practice at the time and likely part of Thomas’s desire to entertain audiences). 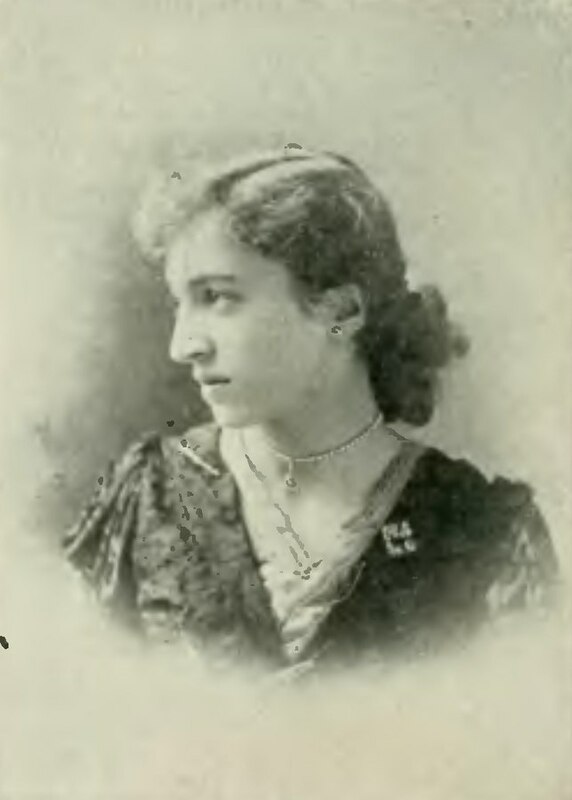 Composer and pianist Julia Rivé-King—who already had a well-established career as a soloist, having toured the U.S. with Thomas and his orchestra in the 1880s—also appeared frequently with the Chicago Orchestra and traveled to the Metropolitan Opera House in Saint Paul, Minnesota in March 1892 to perform Saint-Saëns’s Rhapsodie d’Auvergne. 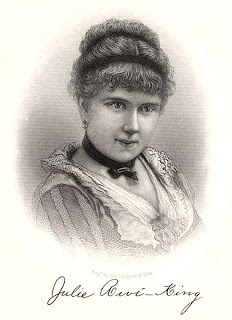 The Saint Paul Daily Globe reported that “the applause which followed [her performance] was so persistent that the famous pianist was forced to return with an encore.” In her book Unsung: A History of Women in American Music, Christine Ammer estimates that by the time Rivé-King would have appeared in Saint Paul, she would have performed in nearly 1,800 concerts since her 1873 debut. She became a fixture of Chicago’s musical life, teaching for over thirty years at the Bush Conservatory of Music. 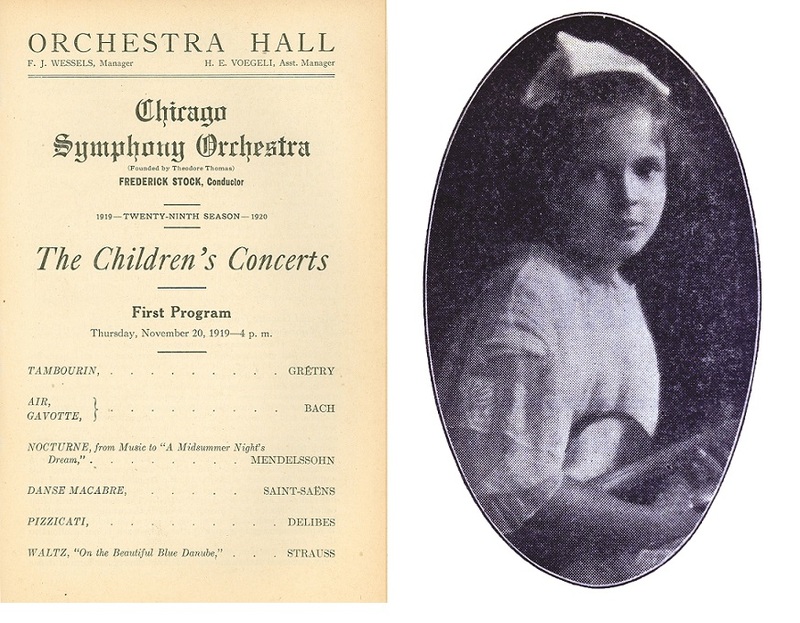 The support of the Orchestra also was given to fourteen-year-old pianist Augusta S. Cottlow on November 30, 1892, for a “testimonial concert” at the Central Music Hall in Chicago. 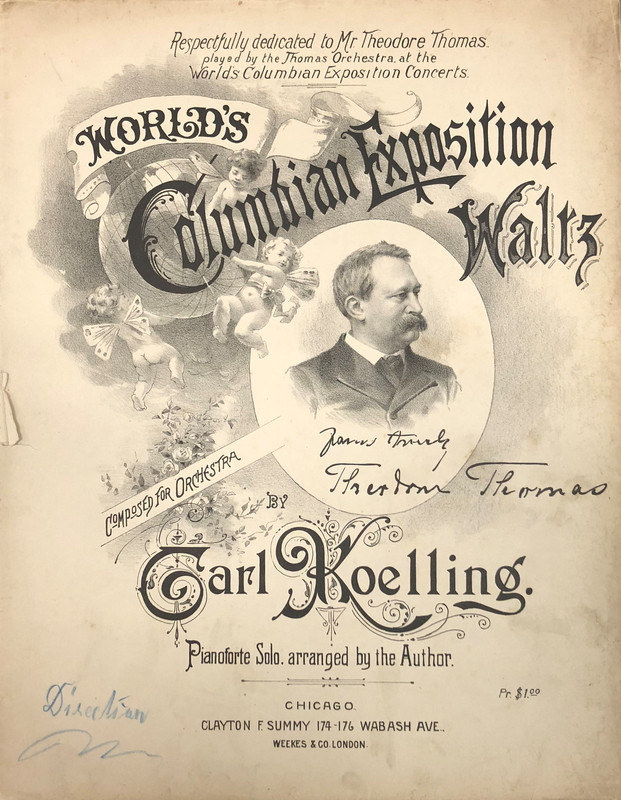 It is unclear how Thomas met or learned of Cottlow (perhaps through her teacher, the Chicago-based Carl Wolfsohn) or why he was willing to throw the full might (and cost) of the Orchestra behind a concert for her. 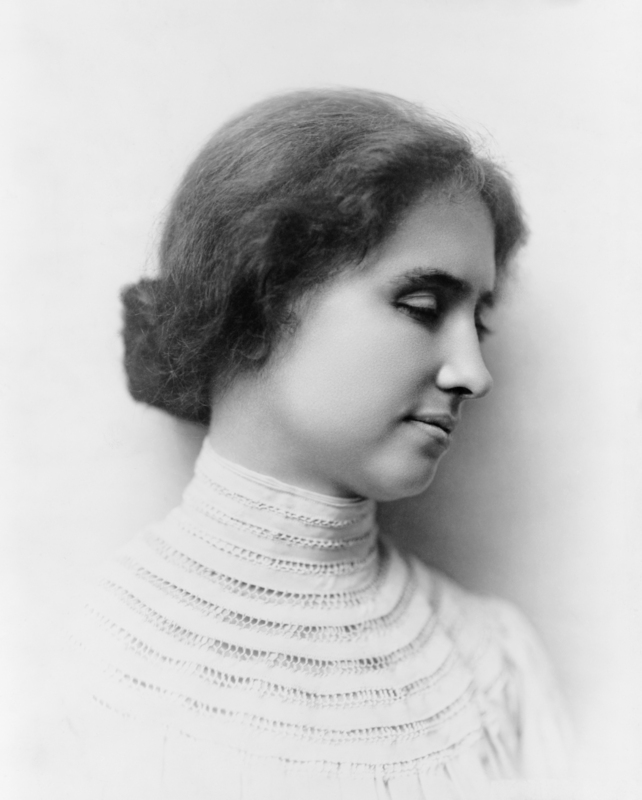 It might have been a benefit concert to fund her impending trip to Europe; however, as late as 1895, she was still appearing in concerts around Chicago. 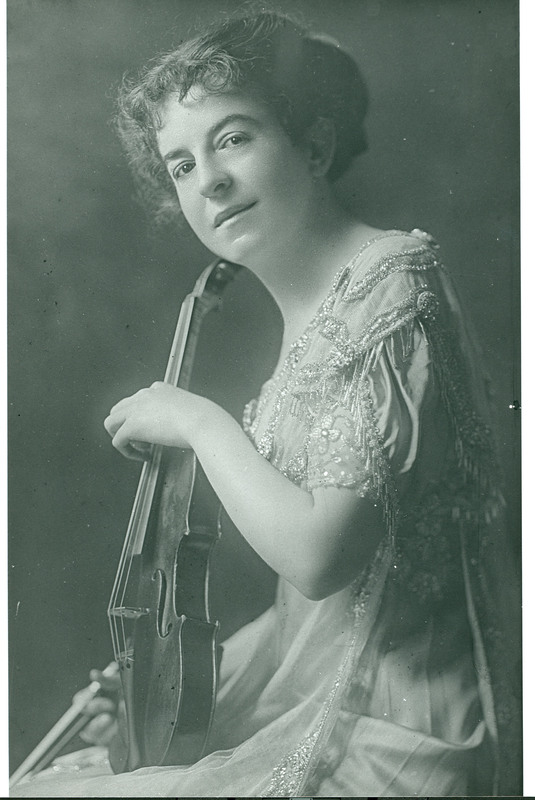 While Rivé-King, Bloomfield Zeisler, and Powell had long careers as performers, the story of violinist Mary Currie Duke is perhaps more representative of the professional trajectory for many women musicians of this period. 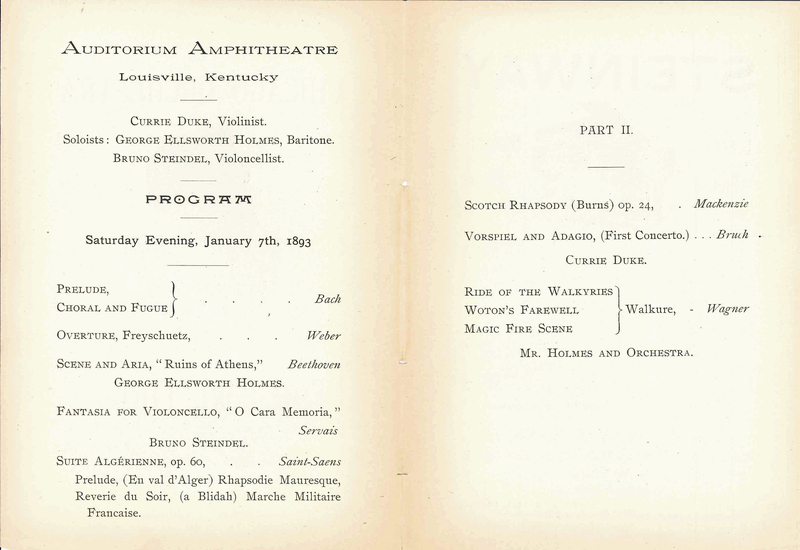 There are few data points about her, but her appearance with the Chicago Orchestra at the Amphitheatre Auditorium in Louisville, Kentucky on January 7, 1893, is noteworthy and likely led to her invitation to perform for the World’s Congress of Representative Women at the World’s Columbian Exposition later that year. The Californian Illustrated Magazine of November 1893 indicates that she spent some time studying music abroad in Europe, even claiming that she became “one of [Joseph] Joachim’s idols” and had performed Bruch’s First Violin Concerto with the composer accompanying at the piano. 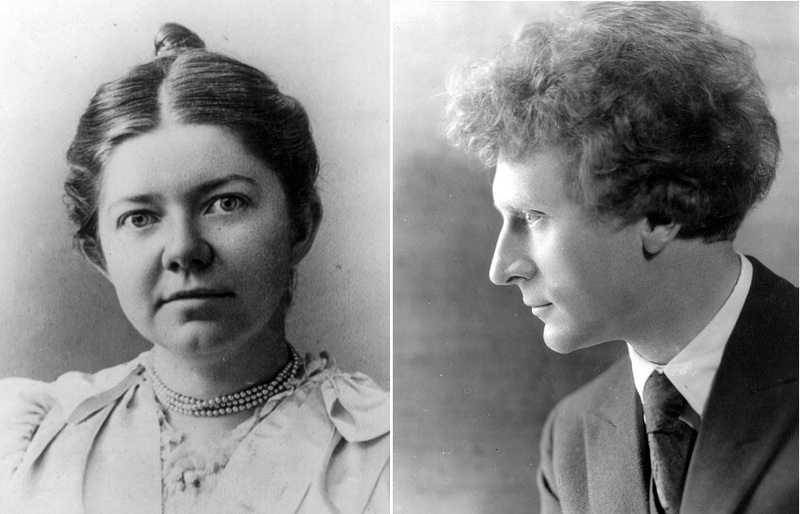 Duke married William Matthews in 1899, and it is unclear if she continued her musical career following her marriage. 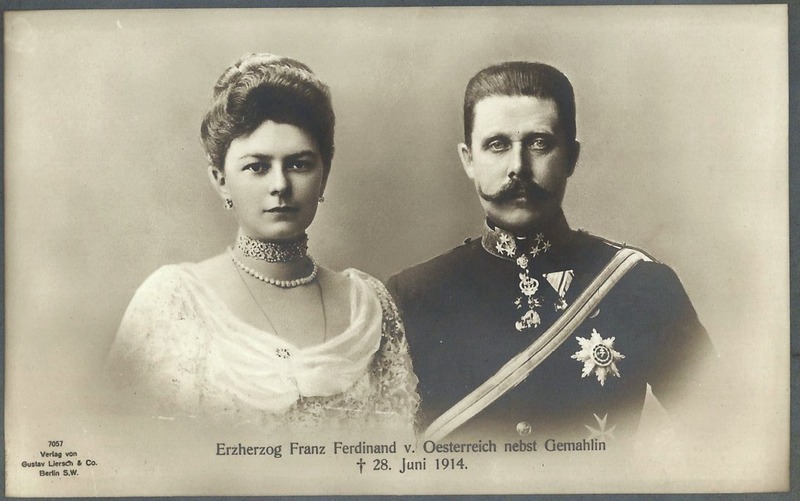 However, according to Gary Matthews’s biography of her father General Basil Wilson Duke, her husband died in 1910, putting her in a precarious financial position. While she might have returned to the stage in order to earn an income, she developed arthritis soon after her husband’s death, definitively ending her performing career. 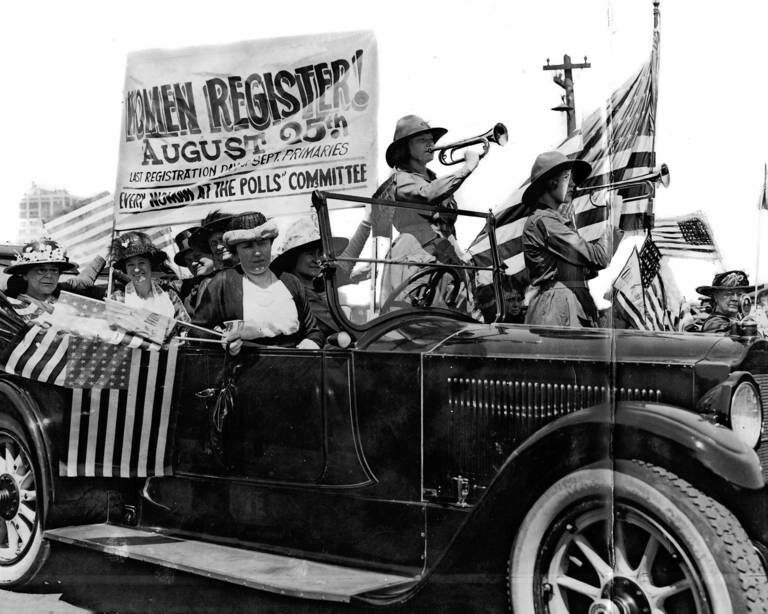 As discussed in part 1, the Orchestra’s third season saw a drastic reduction in the number of tour concerts and, as a result, fewer performing opportunities for women. 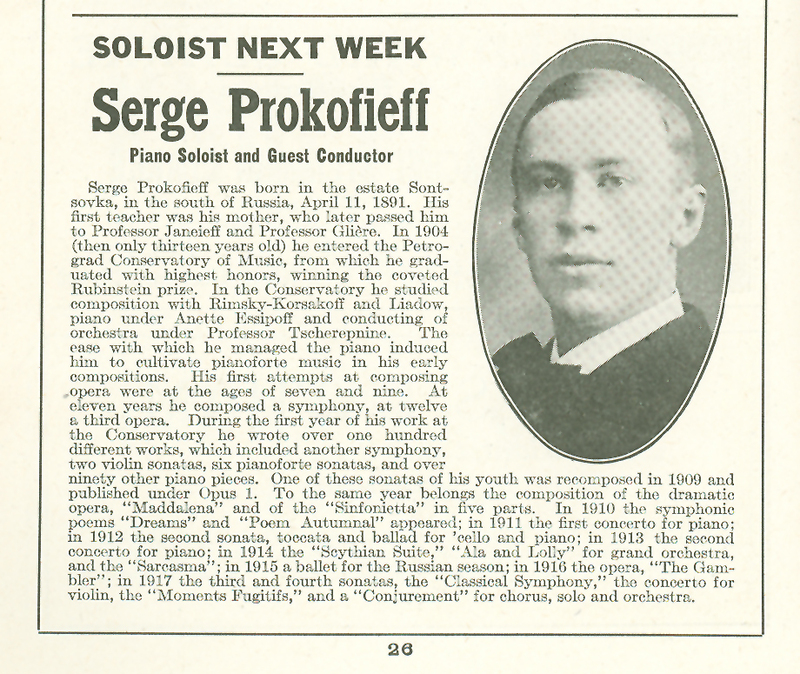 However, two unusual concerts in Chicago helped launch the careers of several singers. 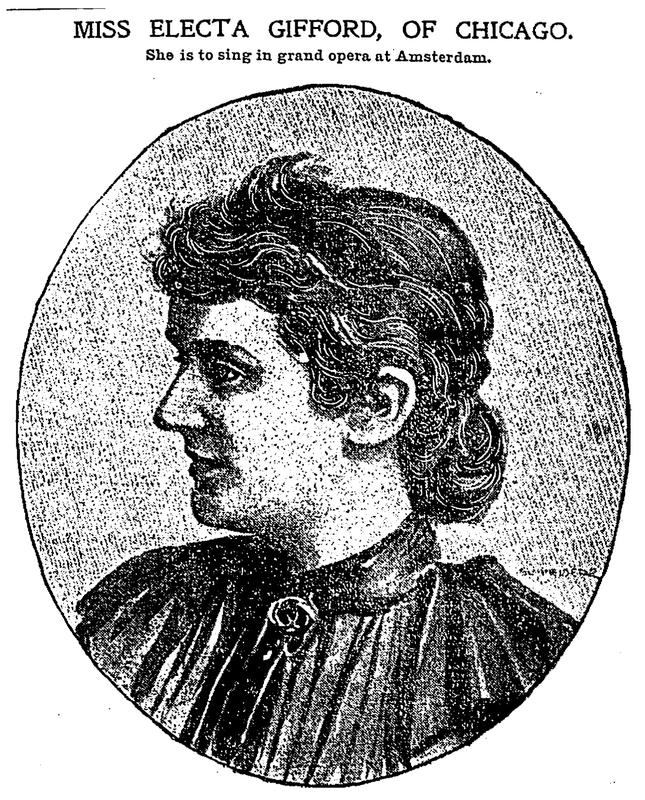 A “Grand Concert” was given by soprano Electa Gifford at Central Music Hall on November 27, 1893, where she was accompanied by Thomas and the Chicago Orchestra. 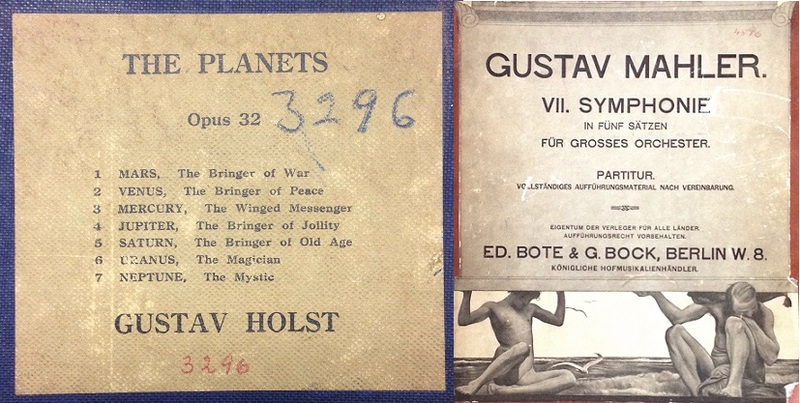 The concert was a mix of vocal works performed by Gifford along with standards from the Orchestra’s tour repertoire, including the Forest Murmurs from the second act of Wagner’s Siegfried. Once again, it is unclear how Thomas came to know Gifford, but this act of patronage had an important impact on her career. 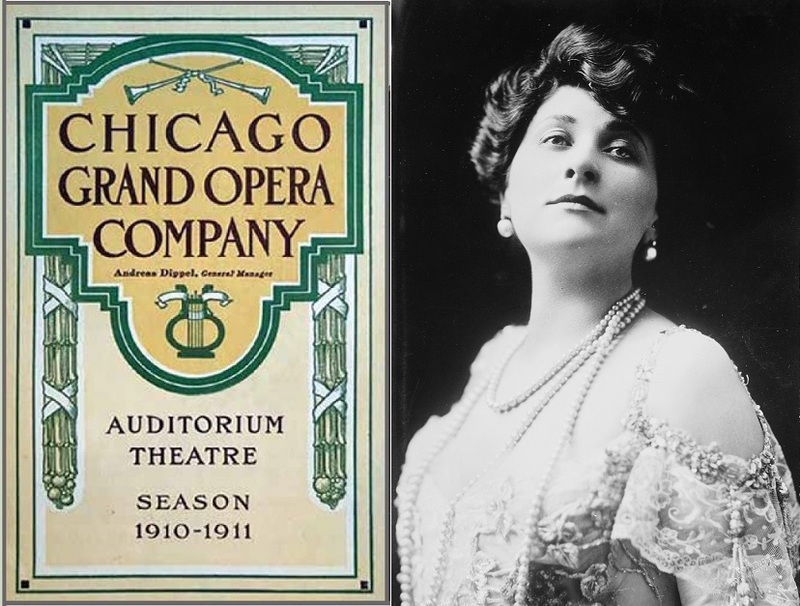 In August 1899, the Chicago Tribune announced her engagement with the Grand Opera of Amsterdam, where she sang the lead soprano roles in many of the company’s performances that season. The lives and careers of female performers at the end of the nineteenth century are often difficult to assemble, punctuated as they were by long periods of absence due to marriages and births in ways that did not similarly affect the careers of male musicians. 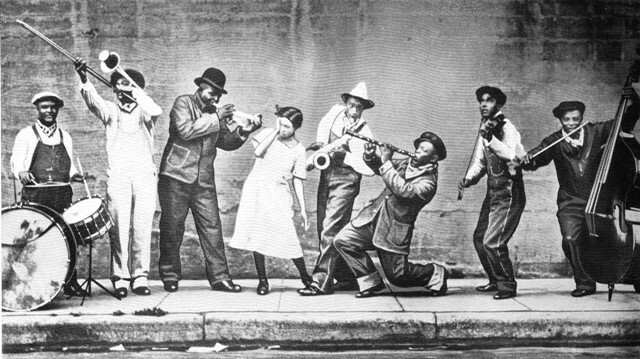 However, following the clues offered in the surviving programs of the Orchestra’s initial seasons demonstrates that Chicago was rapidly becoming a hub for the musical education of men and women at this time, and illuminates the direct role that Theodore Thomas and the Orchestra often played in launching many a career. Jenna Harmon is a doctoral candidate in musicology at Northwestern University and an intern in the Chicago Symphony Orchestra Association’s Rosenthal Archives. 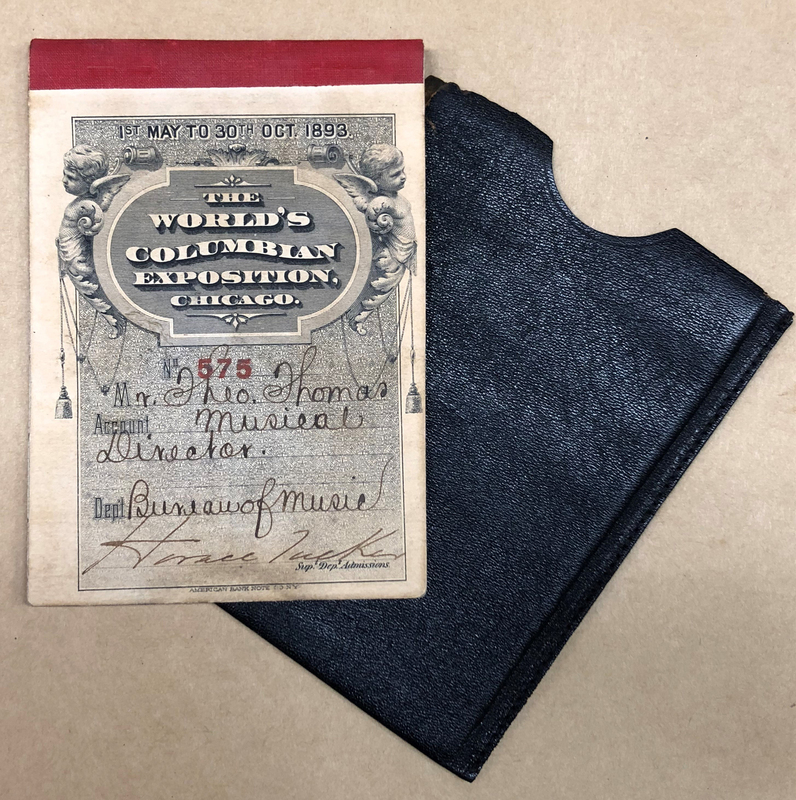 The opening of the first season of the Chicago Orchestra in October 1891 was a momentous occasion not only for the city whose name the Orchestra bore, but also, as the collections in the Rosenthal Archives show, for towns all over the Midwest. 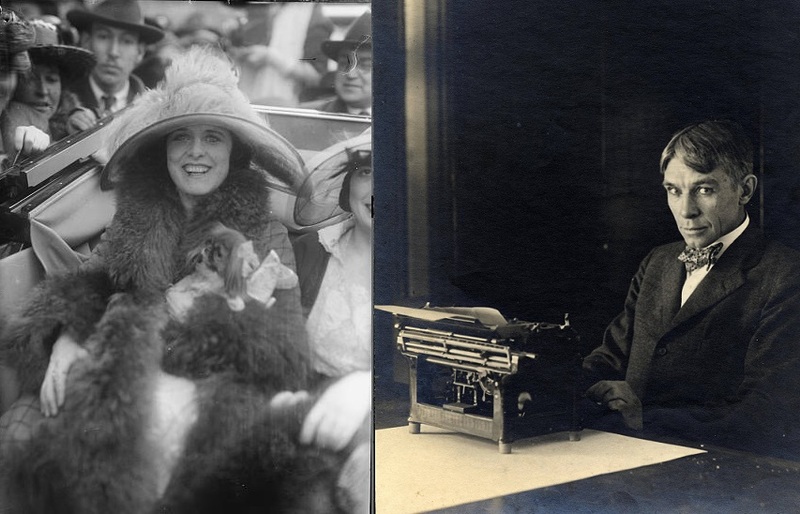 Founder and first music director Theodore Thomas was passionately devoted to bringing music to people of all means, not just those who lived in the metropolitan centers and could afford tickets. This isn’t to say, of course, that Thomas wasn’t interested in the opinions of those same well-off people. 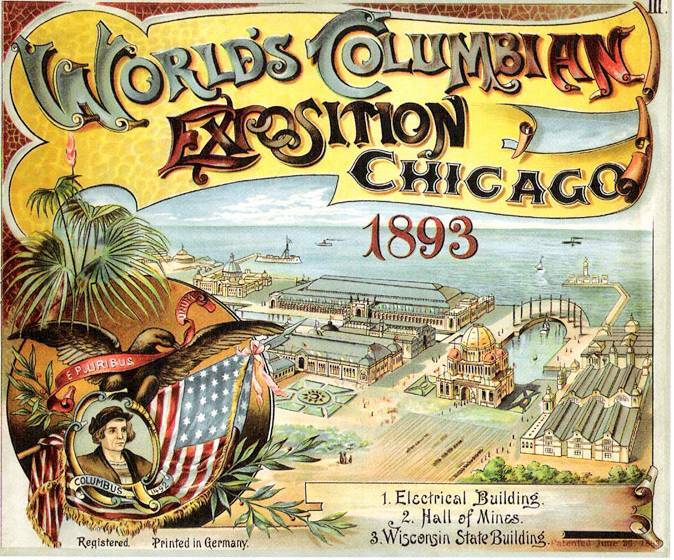 Part of the reason for the expansive tour schedule the Orchestra observed that first season was to spread the word that Chicago was no longer a backwards slaughterhouse town, a stereotype the city was actively fighting in the lead up to, and even after having won the privilege of, hosting the 1893 World’s Columbian Exposition. Thomas eagerly, and ambitiously, sought to show off the talents and achievements of his new hometown, while also sharing those accomplishments with smaller cities around the Midwest and the South. 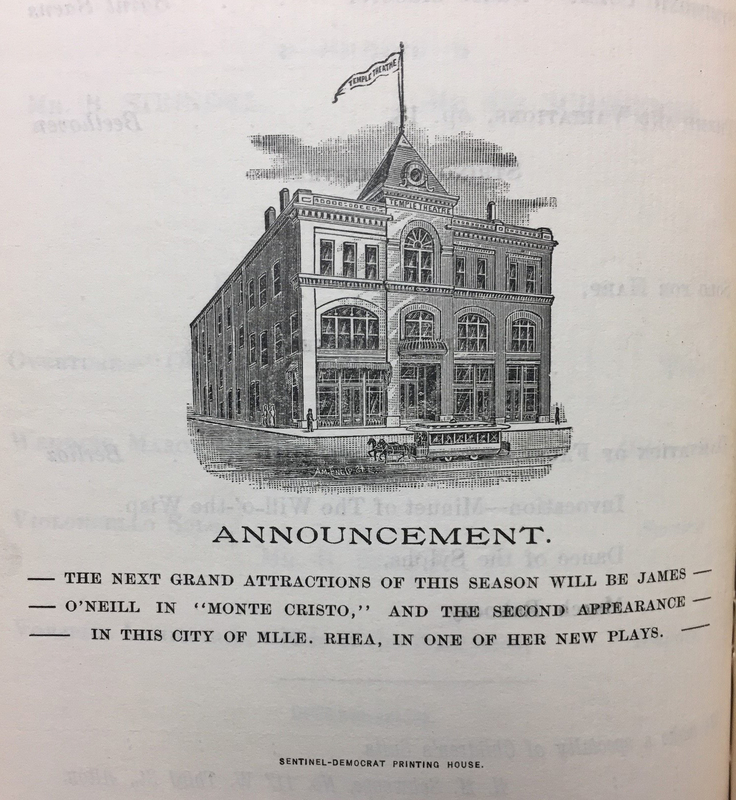 Following the inaugural concerts at the Auditorium Theatre on October 16 and 17, Thomas and the Chicago Orchestra traveled to Rockford, Illinois for a concert at the Grand Opera House on October 19, and through end of May 1892, they journeyed to eighteen different cities. 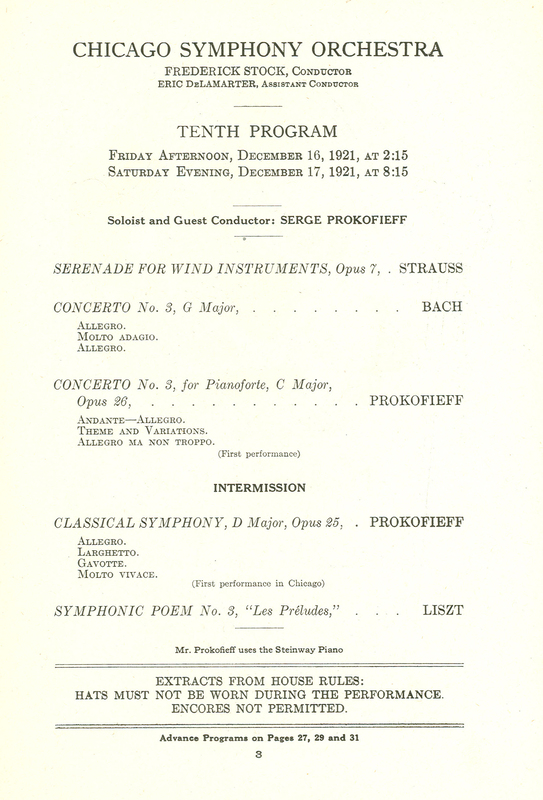 While there was significant overlap in the repertoire performed, the Orchestra rarely played the same exact program twice, requiring them to have a large amount of music prepared for performance at all times. Many of these concerts were a mix of “high” and “low” repertoire, with the Orchestra performing standards, like Beethoven and Tchaikovsky, along with lighter fare, including Arthur Goring Thomas’s A Summer Night. Neither were these light affairs; one concert in Milwaukee on March 22 featured an extended Wagner-only second half with many of the most difficult pieces in the orchestral repertoire, including overtures to The Flying Dutchman and Lohengrin and the infamous Ride of the Valkyries from Die Walküre. 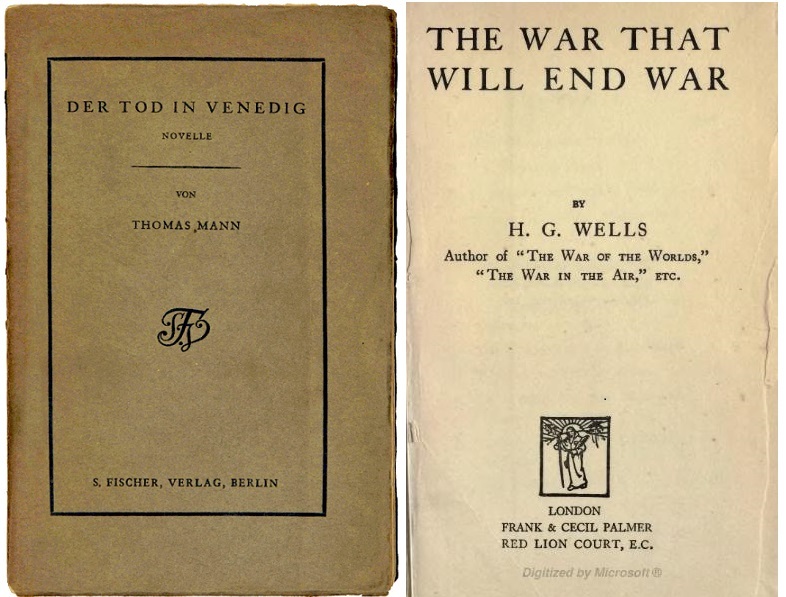 Other common works in the repertoire included Thomas’s orchestral arrangement of the third movement—the slow Marche funèbre or Funeral March—from Chopin’s Piano Sonata no. 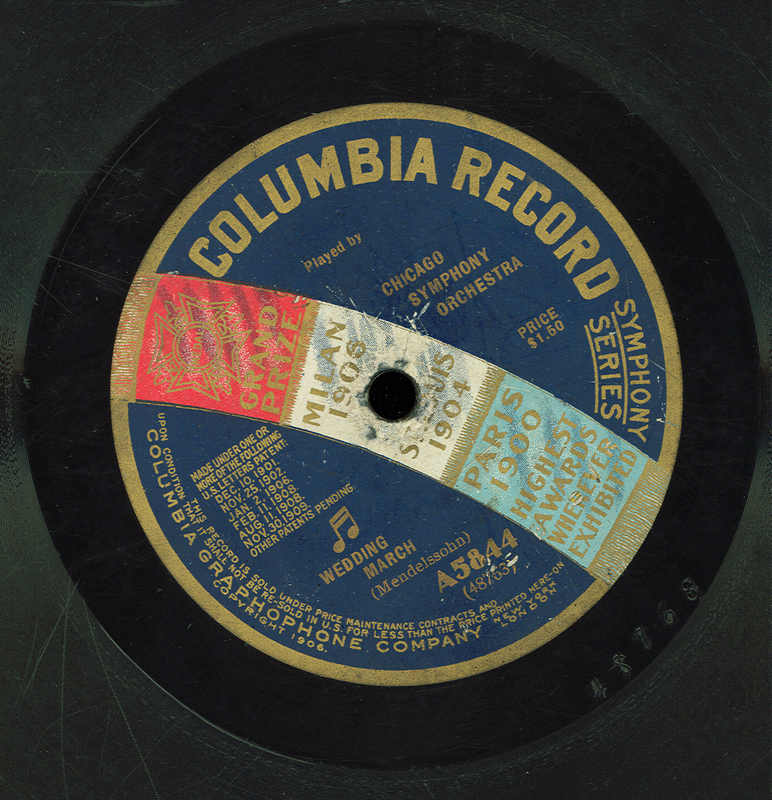 2, Mendelssohn’s Overture to The Fair Melusina, and the intermezzo from Mascagni’s Cavalleria rusticana (fresh from its September 1891 U.S. premiere in Philadelphia). The Orchestra’s ability to perform such demanding music becomes even more astonishing upon looking at the tour schedule, where players were frequently given only one day off between concert sets, and likely that time was spent traveling by train from city to city. 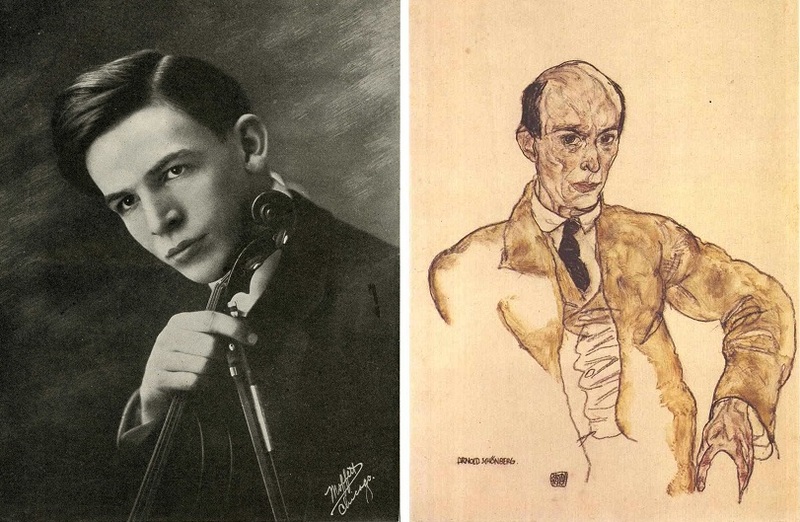 Many of the same musicians regularly were featured as soloists—concertmaster Max Bendix, along with several principals: cello Bruno Steindel, clarinet Joseph Schreurs, and flute Vigo Andersen—sidestepping the issue of finding local talent or soloists willing to travel, while also giving Thomas the chance to showcase the tremendous talents at his disposal. 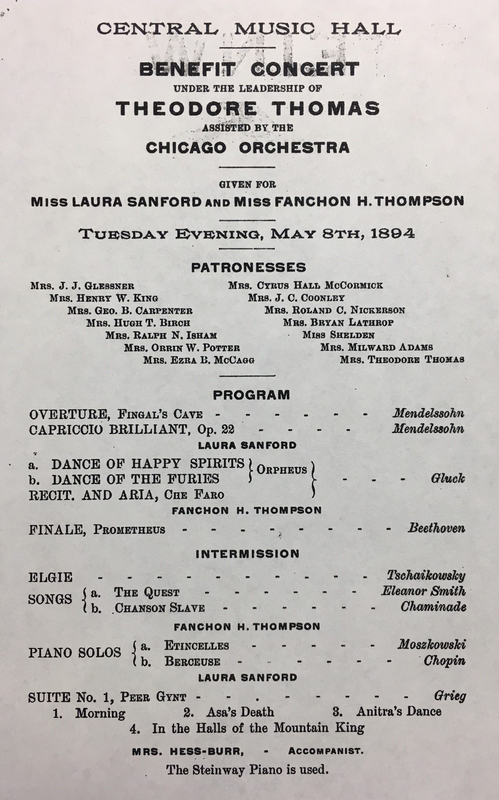 Many of the theaters that welcomed the Orchestra were themselves quite new, many calling themselves “opera houses,” since opera was considered more “respectable” than mere theater. 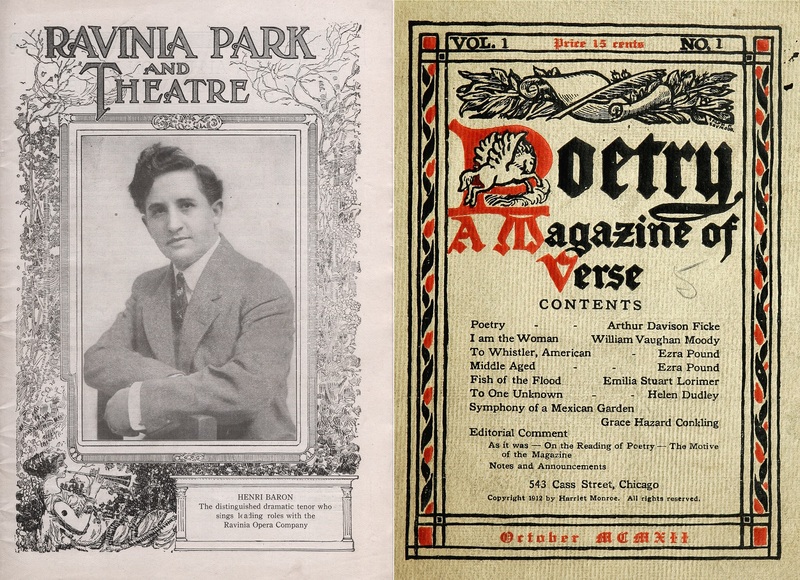 While opera was sometimes performed in these venues, more often than not they welcomed touring music groups like the Chicago Orchestra, as well as vaudeville and minstrel shows. Many of these theaters have since been demolished, but in their day, they were architectural jewels, as many of the surviving photos and drawings can attest. 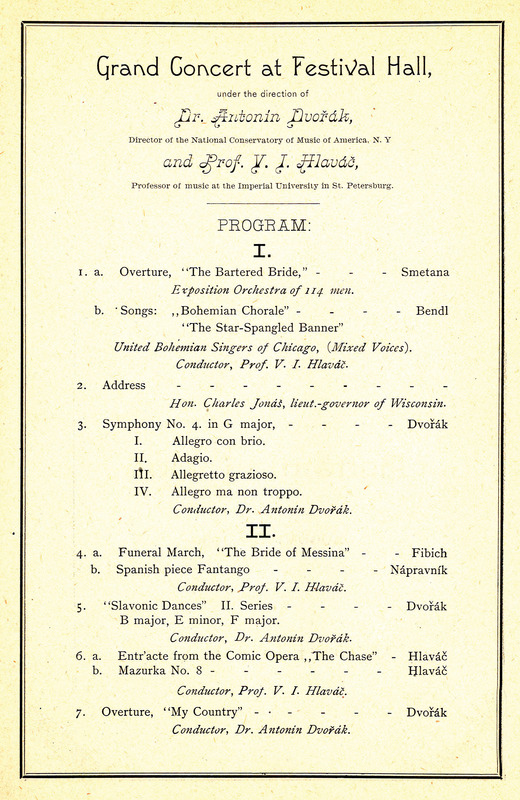 In the first season, it seems that the Orchestra relied on local event organizers to print up programs, leading to occasionally humorous mis-hearings of titles. For example, Delibes’s suite from the ballet Sylvia frequently concluded a program, and its last movement is Les chasseuses or The Huntresses; the name of this movement was subjected to many different spellings, including Les chesseresses, Les chausseures, and even The Shoes. 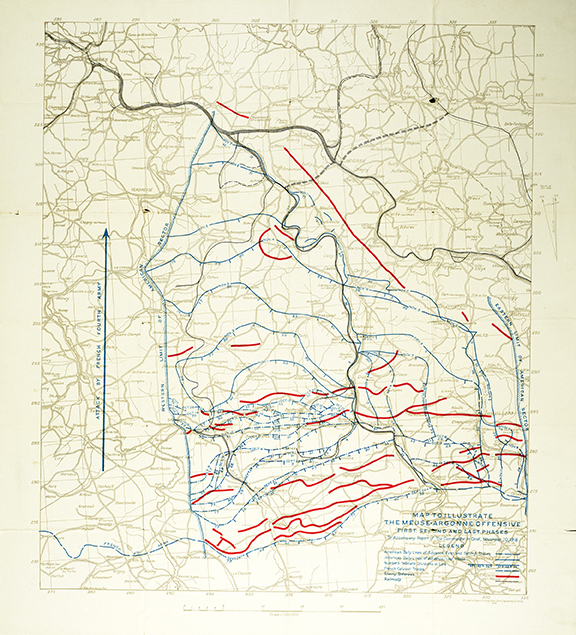 By the second season (1892-93), many of these rough edges had been smoothed out. 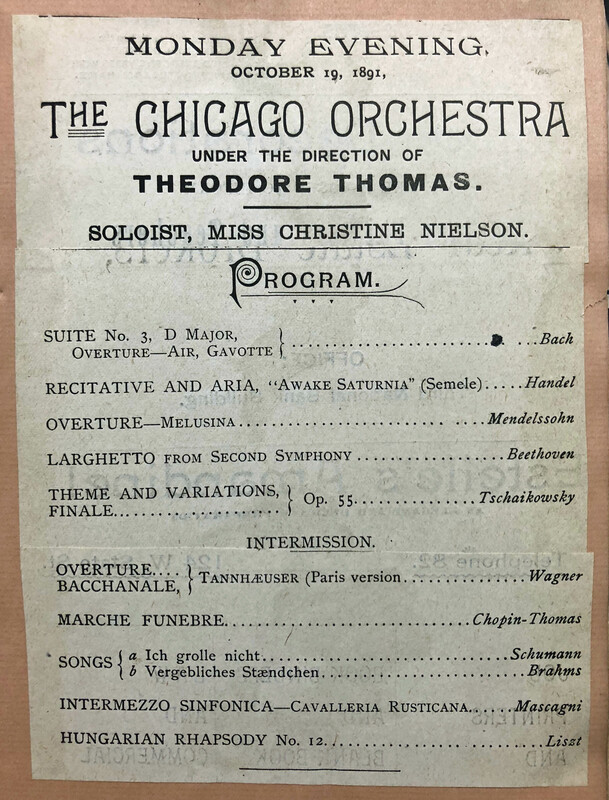 Having noticed the inconsistencies in the titles, Chicago Orchestra management began printing the program books, each bearing Thomas’s face on the front cover and with standardized titles. The concerts themselves also became more consistent, with much less variety in programmed music from city to city. However, the Orchestra’s out-of-town trips would soon become far less frequent: from a grand total of fifty-five concerts in the first season, to forty-five in the second, and a mere fifteen in the third season. Deficits that hounded the Orchestra’s early seasons are most likely to blame, as the expense of such frequent tours could no longer be justified; though the exhaustion of the musicians surely had an effect as well. Thomas’s personal drive to bring music to the masses soon found other outlets. 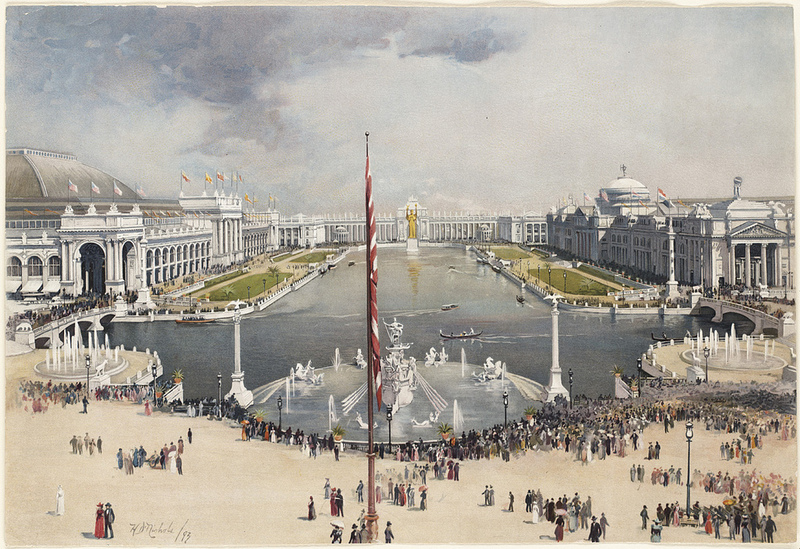 Having been named the the director of the Bureau of Music for the World’s Columbian Exposition, he was ready to become the city’s chief musical ambassador to the millions of people who would visit. 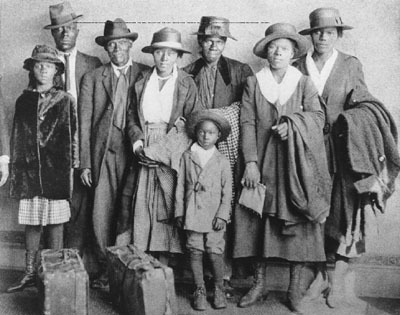 Thomas also implemented a series of “workingmen’s concerts,” where ticket prices were significantly reduced in order to allow those who could not otherwise afford to attend the Orchestra’s subscription concerts. But wait, there’s more . . . stay tuned for part 2 of this dive into the Orchestra’s early touring days, which will focus on female guest soloists! The fairgrounds stretched over nearly 700 acres in Jackson Park and officially opened to the public on May 1, 1893—125 years ago. Over the next six months, nearly fifty countries would exhibit and close to twenty-eight million people would visit. 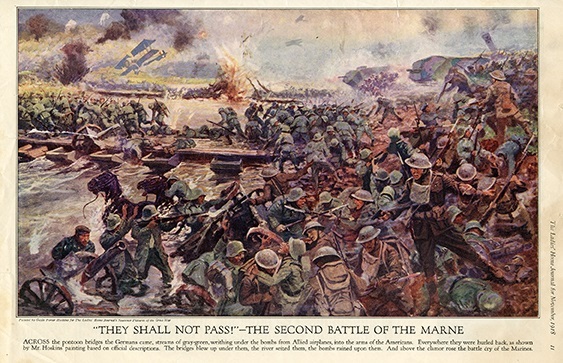 Juicy Fruit chewing gum, Cream of Wheat, Quaker Oats, Shredded Wheat, Aunt Jemima pancake mix, and the Ferris Wheel were introduced, along with the first U.S. Post Office–issued picture postcards and commemorative stamps and U.S. Mint–issued commemorative quarter and half-dollar coins. Following its blue ribbon–win as “America’s Best” at the exposition, the Pabst Brewing Company officially changed the name of its signature beer. 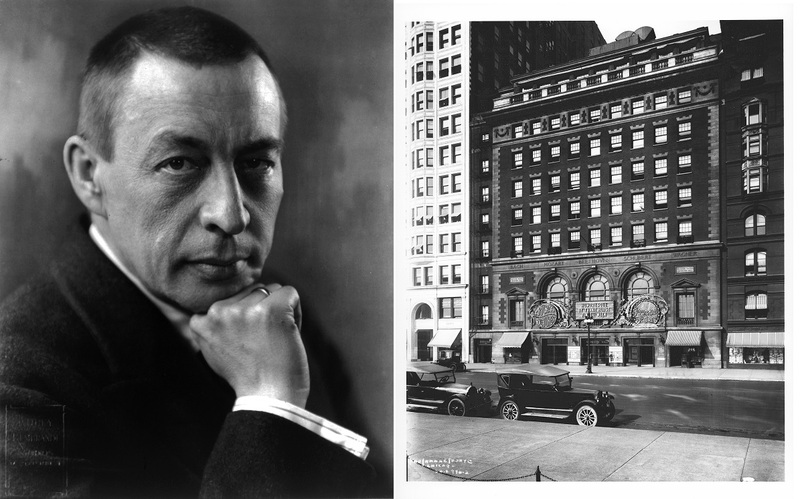 Soon after Theodore Thomas agreed to lead the new Chicago Orchestra, the exposition’s executive committee (many of whom were the same men who were helping to finance his new orchestra) offered him the job of director of music for the fair. 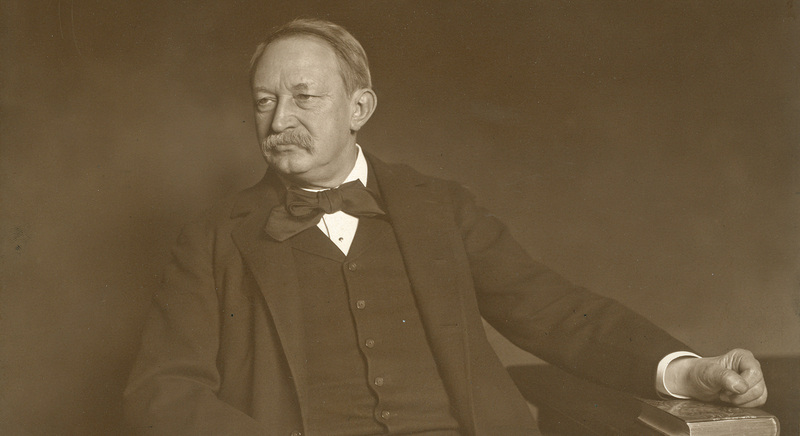 Inspired by Burnham’s imagination and drive—not to mention that the committee was prepared to spend nearly one million dollars on music and two performance halls—Thomas accepted shortly after his new orchestra’s inaugural concerts on October 16 and 17, 1891, in the Auditorium Theatre. 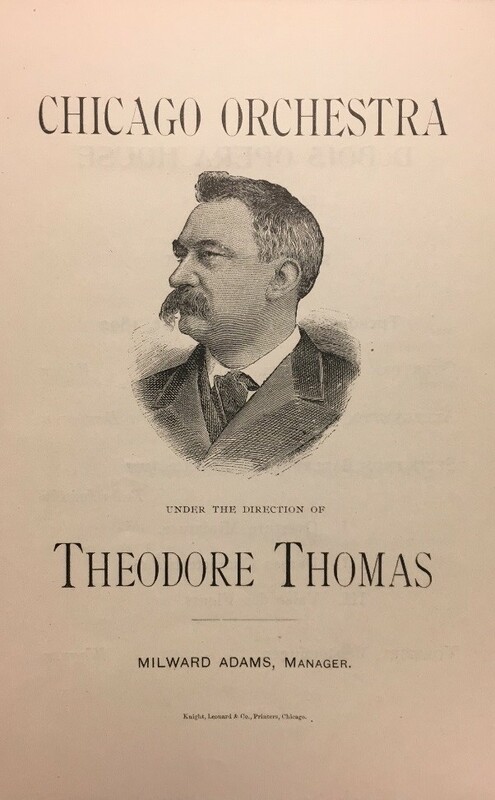 Thomas laid out an extensive plan for all types of concerts and issued a proclamation in the spring of 1892 setting forth many lofty goals, among them “the hearty support of American musicians, amateurs, and societies, for participation on great festival occasions of popular music, and for the interpretation of the most advanced composition, American and foreign.” He made his new orchestra the foundation of the resident ensemble, the Exposition Orchestra, augmented to over one hundred players, and he invited the most important musicians in the world to participate: Johannes Brahms, Antonín Dvořák, Joseph Joachim, Piotr Tchaikovsky, Jules Massenet, Camille Saint-Saëns, Giuseppe Verdi, Pietro Mascagni, Charles Gounod, Anton Rubinstein, and Hans Richter, among others. Two music buildings were constructed for a combined cost of $230,000. Music Hall, designed by Charles Atwood, had two performance spaces, seating 600 and 2,000. 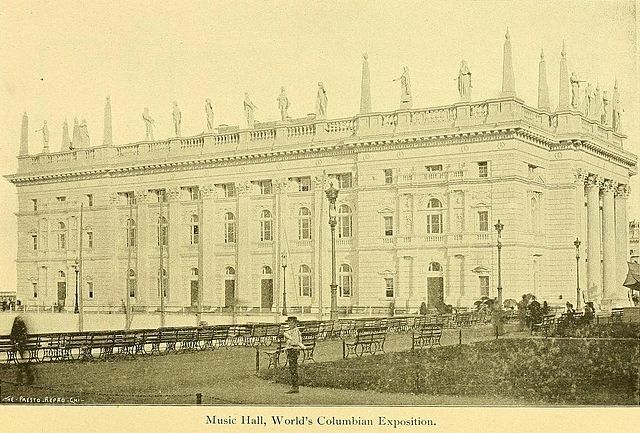 Festival Hall, designed by Francis M. Whitehouse, had a stage that was reportedly larger than the entire Metropolitan Opera House and seated 4,000 with standing room for more than 2,000. 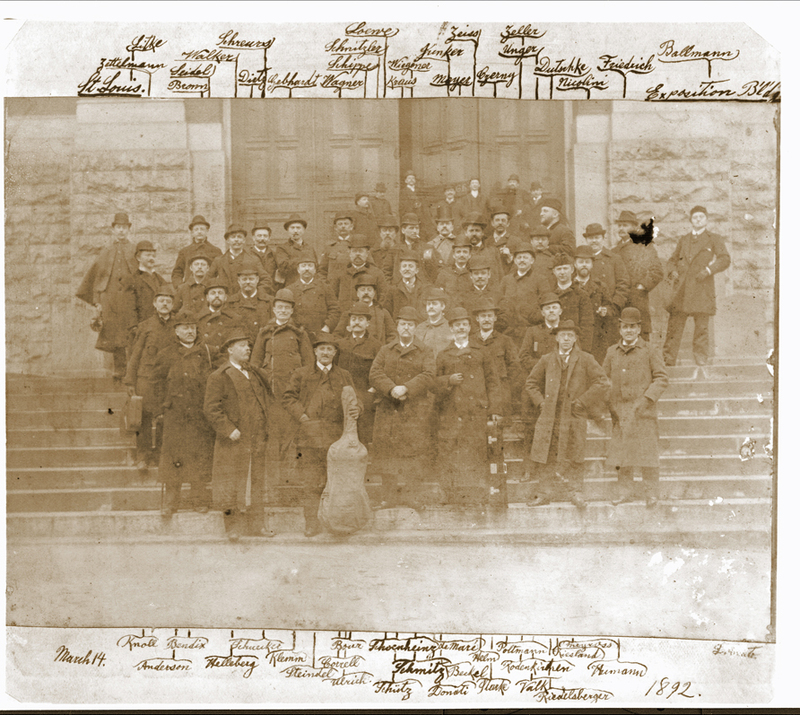 The inaugural ceremony on October 21, 1892, was given in Festival Hall and included 5,500 singers in the chorus, an orchestra of 200, two large military bands, and two drum corps of fifty players each. 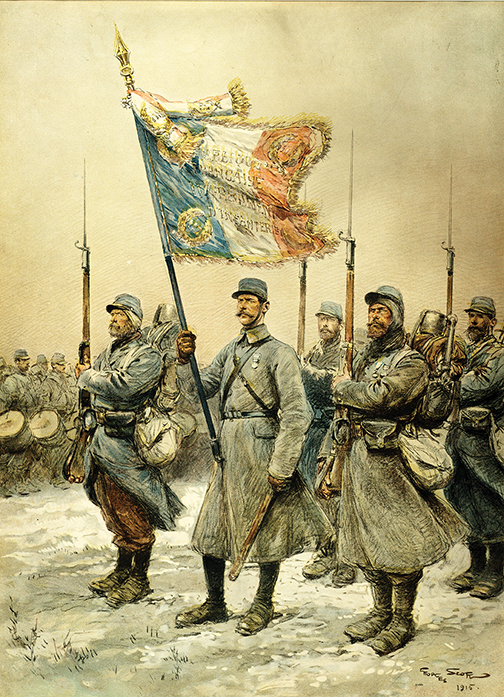 In order to for everyone to see, Thomas used a large white handkerchief to conduct, rather than a baton. 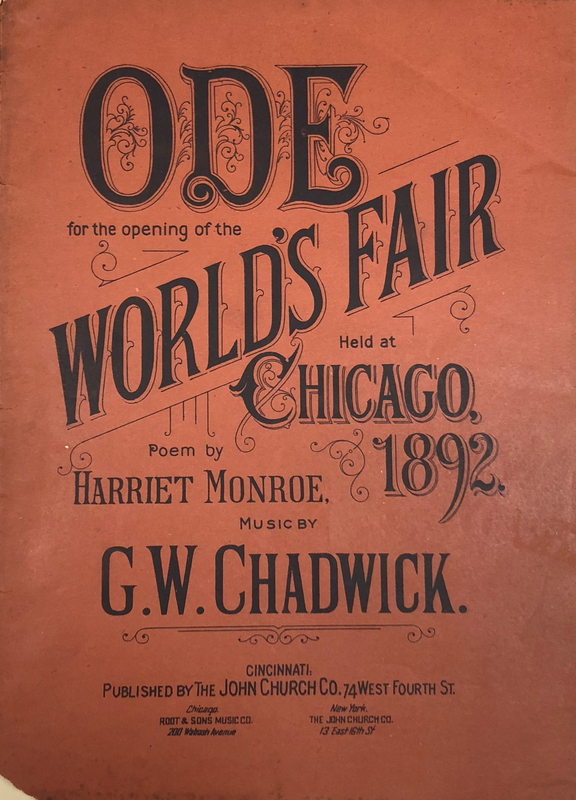 The event opened with the American composer John Knowles Paine’s Columbus March and Hymn, and continued with Carl Koelling’s World’s Columbian Exposition Waltz and George Whitefield Chadwick‘s Ode for the Opening of the World’s Fair held at Chicago 1892 (set to a poem by Harriet Monroe). 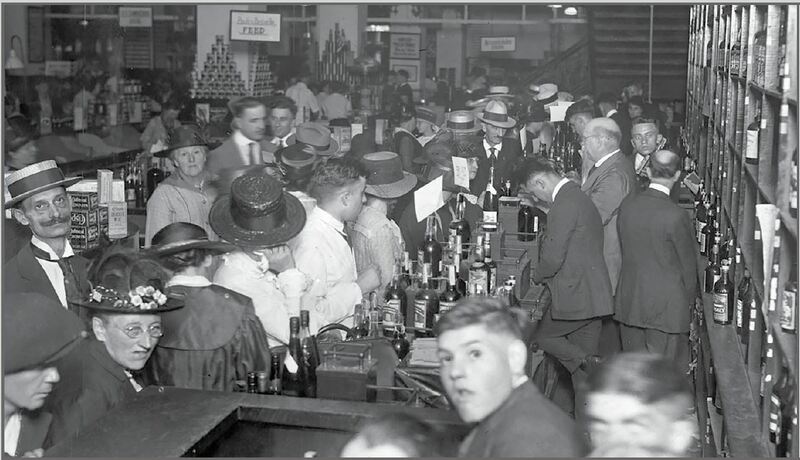 As excitement mounted for the official opening of the fair, nearly one hundred piano manufacturers began to vie for the opportunity to exhibit. 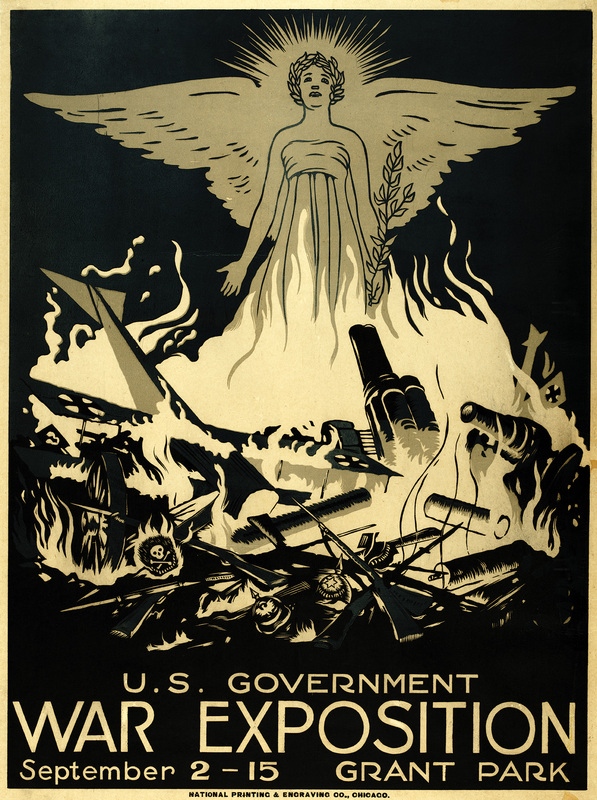 Some exposition officials began to take sides with different manufacturers, and Thomas attempted to steer clear of the growing controversy. East-coast builders, most notably Steinway, felt the planners were giving unfair advantage to Midwest piano manufacturers, and, as a result withdrew their participation. It was decided that only pianos made by exhibiting companies could be used at the fair. The press had a field day, criticizing both Thomas and the exposition planners, accusing all of conspiring for personal advantage. 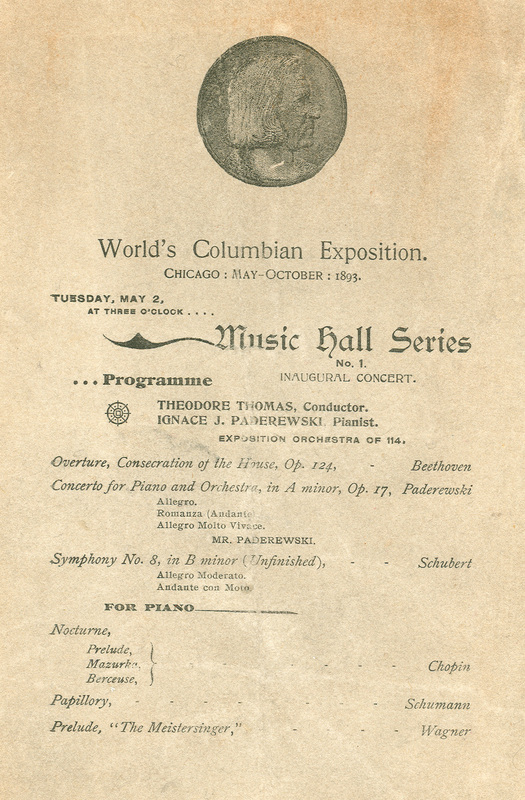 The Exposition’s inaugural concert was scheduled for May 2, 1893, and Thomas’s first choice for soloist was the famous Polish pianist Ignace Paderewski. 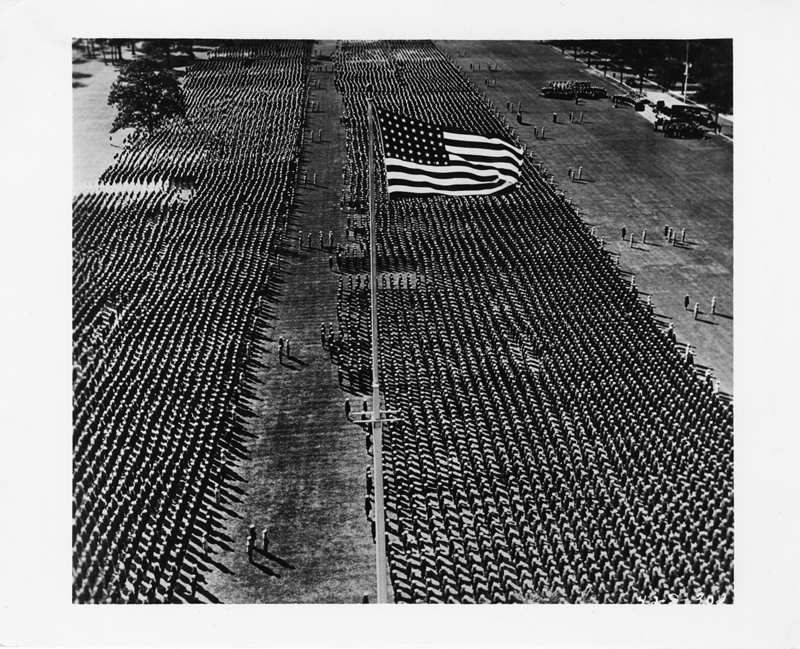 He had performed with the Chicago Orchestra and had even offered to waive his usual $5,000 per concert fee. 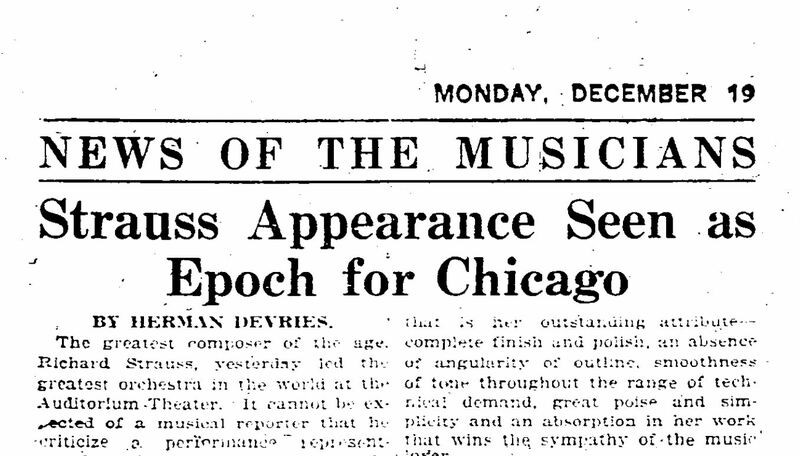 He would perform his Piano Concerto in A minor for the first concert and Schumann’s concerto for the second; Theodore Thomas would conduct the Exposition Orchestra (the Chicago Orchestra expanded to 114 players). 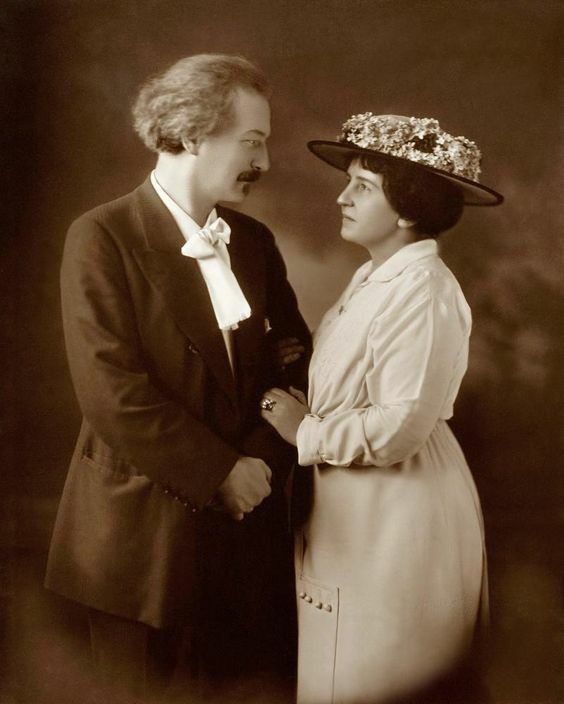 Paderewski was unofficially an exclusive Steinway artist and if he was going to perform, it had to be on a Steinway. With Burnham’s help—and unbeknownst to Thomas—workers were able to sneak Paderewski’s Steinway concert grand into Music Hall the night before the first concert. “Those who sat beneath the potent spell [Paderewski’s] mighty genius weaves could but acknowledge his unrivaled greatness and congratulate the exposition upon having secured him for the assisting artist at the inaugural concert,” reported the Chicago Tribune, praising the “surpassing beauty and matchless artistic greatness” of his performance. 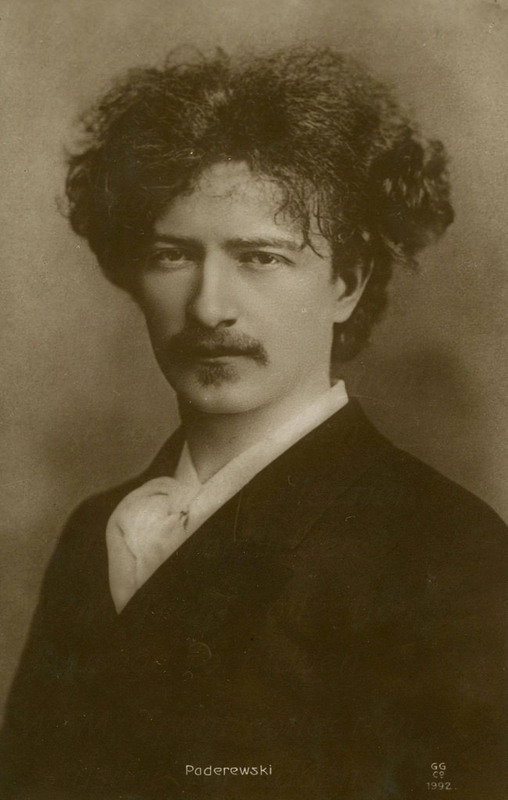 By the time the committee discovered Paderewski’s use of a Steinway, it was too late to react. Thomas was falsely accused of conspiring against the committee, and despite the musical success of the concert, again, he was roasted in the press and public debate and criticism increased. 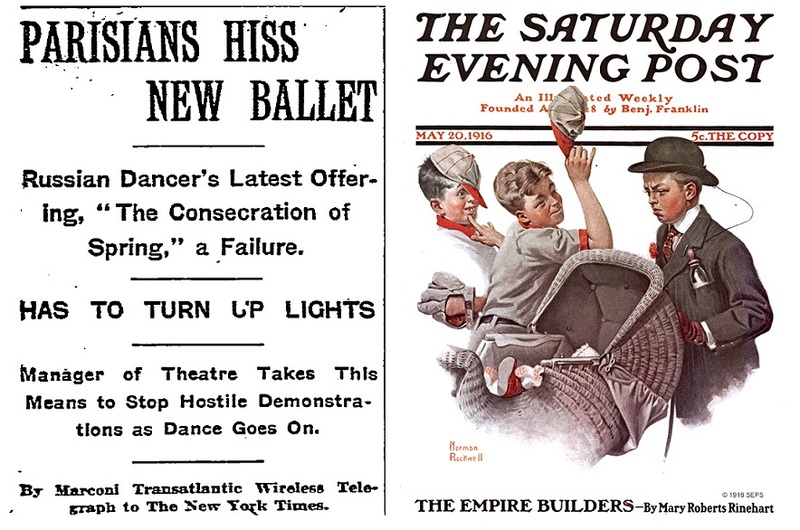 Other problems included the cavernous acoustics in the Music Hall, Chicago’s May weather was bitter cold and the halls were not heated, and ticket sales for concerts were significantly less than anticipated. Thomas had difficulty hiding his disappointment, which only added to the mounting criticism against him. 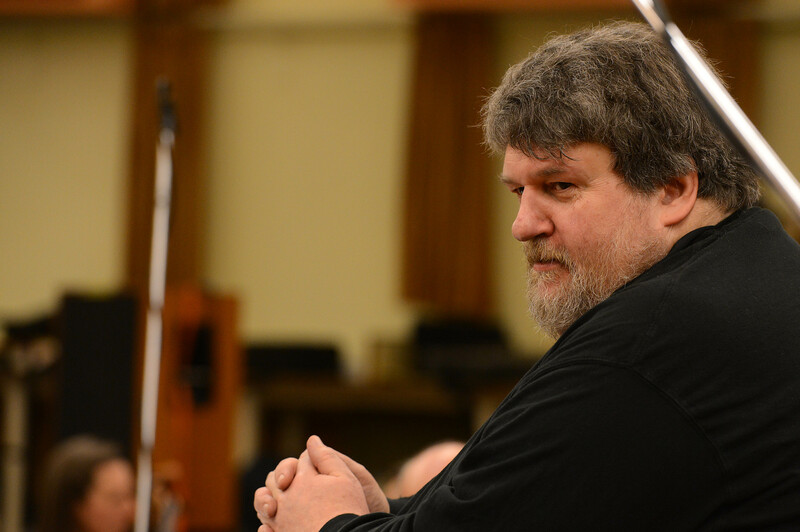 After having conducted nearly seventy concerts in little more than three months, distraught over poor attendance, and mired in controversy, Thomas resigned as musical director in early August. 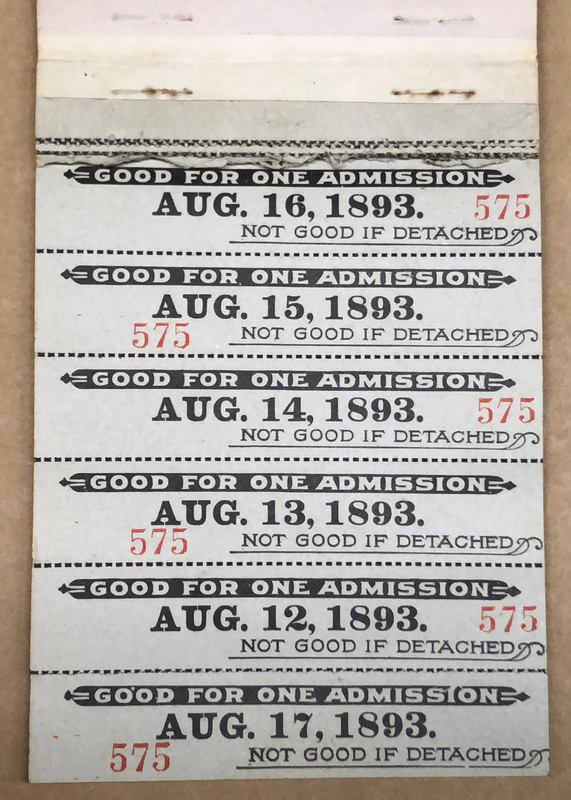 His ticket book for the fair confirms his attendance; the last admission stub removed is for August 11, and at noon that day in Festival Hall, he led his Exposition Orchestra in one last concert. 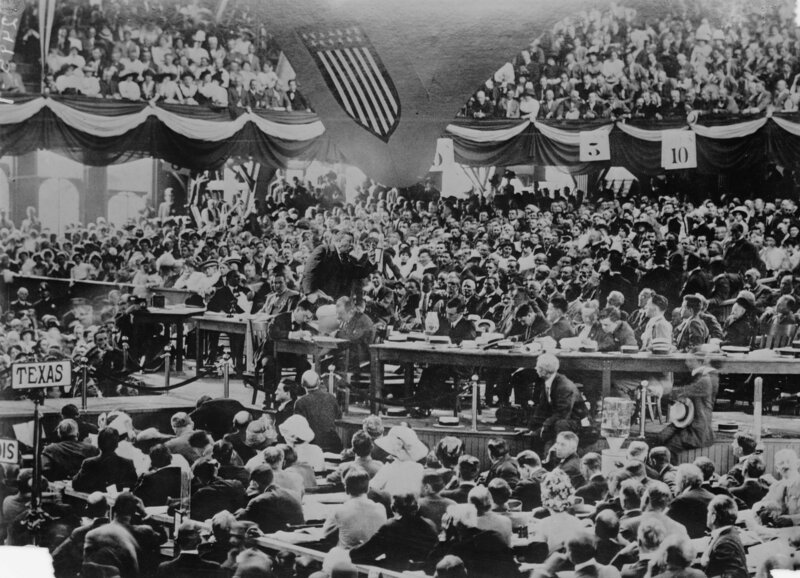 Nearly 8,000 people packed into the fair’s Festival Hall to hear the Exposition Orchestra under the batons of Vojtěch I. Hlaváč, professor of music at the Imperial University in Saint Petersburg, Russia, and Dvořák, then the director of New York’s National Conservatory of Music in America. The Tribune reviewer continued. “As Dvořák walked out upon the stage a storm of applause greeted him. For nearly two minutes the old composer [age fifty-one!] stood beside the music rack, baton in hand, bowing his acknowledgements. The players dropped their instruments to join in the welcome. Symphony no. 4 in G major [now known as no. 8], considered a severe test of technical writing as well as playing, was interpreted brilliantly. The Orchestra caught the spirit and magnetism of the distinguished leader. The audience sat as if spell-bound. 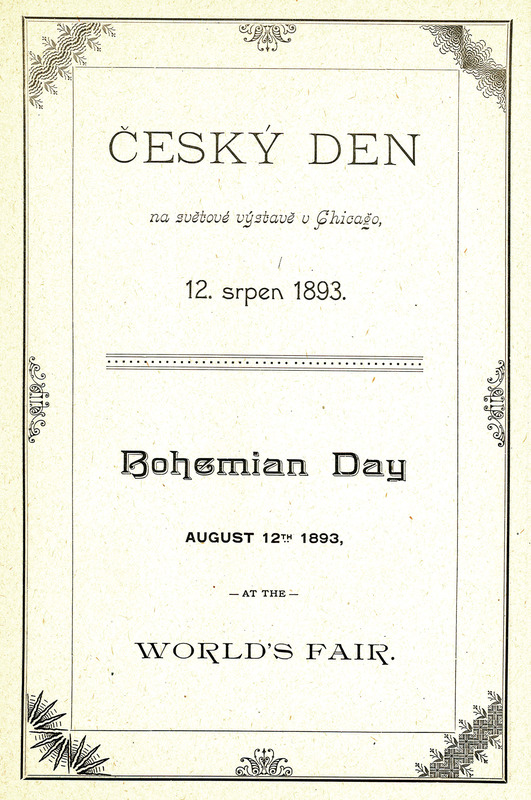 Tremendous outbursts of applause were given.” On the second half of the program, Dvořák conducted selections from his Slavonic Dances and closed the program with his overture My Country. For the next several weeks, the concerts given were primarily organ recitals. 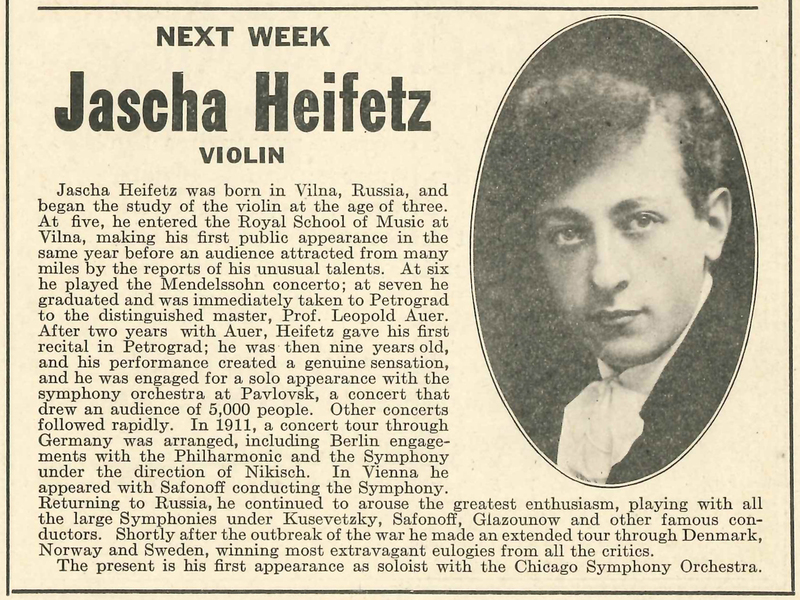 Concertmaster Max Bendix would lead the Exposition Orchestra in most of the remaining scheduled symphonic concerts, and the repertoire was modified to feature lighter, more popular works. 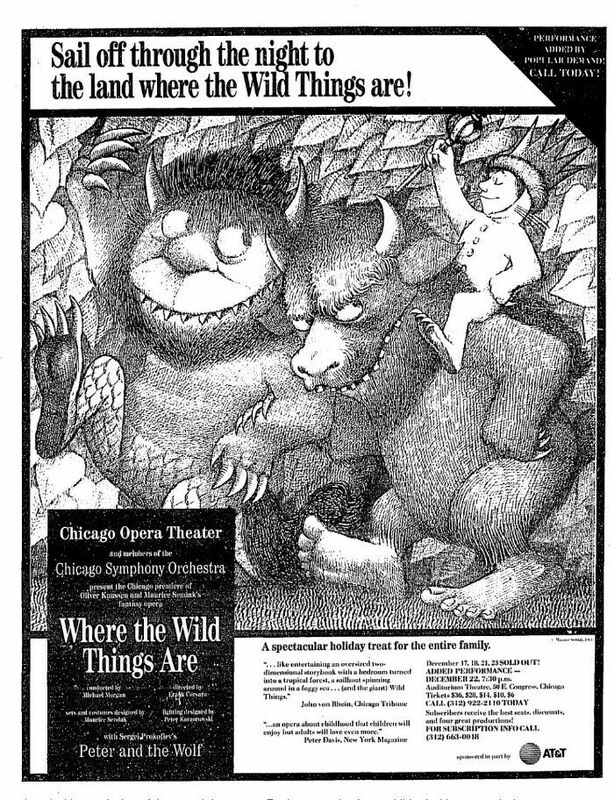 The Chicago Orchestra’s third season began the day after Thanksgiving on November 24 and 25, 1893, at the Auditorium Theatre. Portions of this article previously appeared here and here, and an abbreviated version will appear in the CSO’s May 2018 program book. 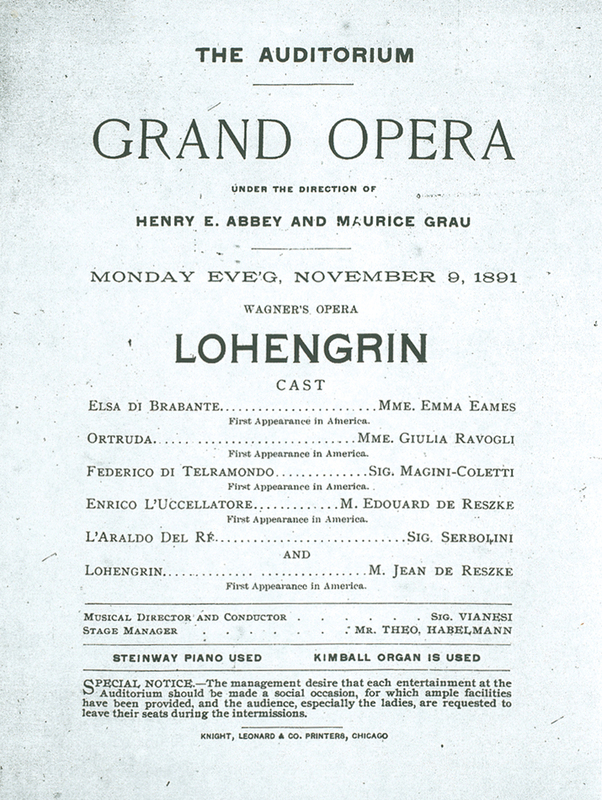 The advance notice for the November 9, 1891, performance of Lohengrin included the names of producers, principal singers, conductor, and stage manager, but not the accompanying orchestra. 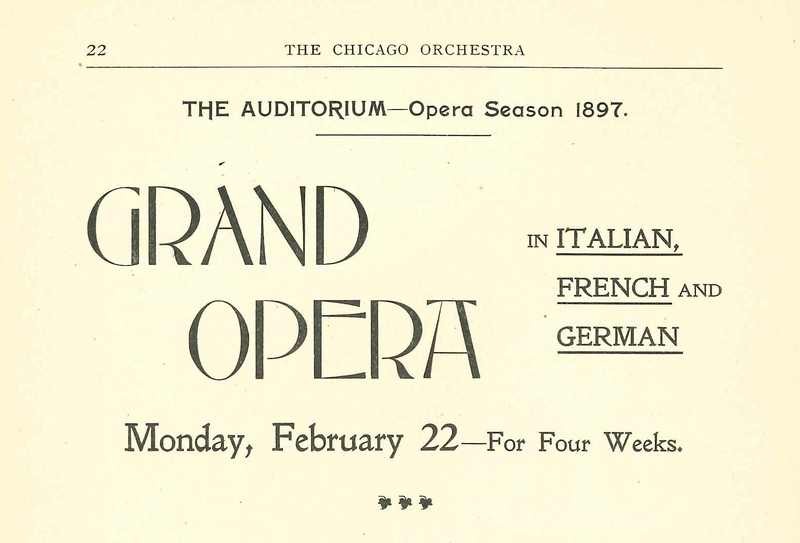 Following the third subscription week of its first season, the Chicago Orchestra (as we were then known) was in the pit of the Auditorium Theatre for performances by the Metropolitan Opera Company from November 9 until December 12, 1891, including three run-out performances at the Amphitheatre Auditorium in Louisville, Kentucky on December 7 and 8. The first opera given was Wagner’s Lohengrin—sung in Italian—led by Auguste Vianesi, the Orchestra’s first guest conductor. That performance featured no less than five singers making their U.S. debuts: soprano Emma Eames, mezzo-soprano Giulia Ravogli, baritone Antonio Magini- Coletti, and tenor and bass brothers Jean and Édouard de Reszke. 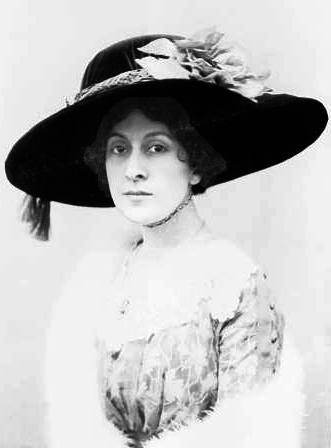 Additional singers who appeared during the residency were among the most famous of the day, including sopranos Emma Albani, Lilli Lehmann, and Marie Van Zandt; mezzo-soprano Sofia Scalchi; tenor Fernando Valero; baritones Edoardo Camera and Jean Martapoura; and bass Jules Vinché. A staggering number of operas were performed, including Bellini’s Norma and La sonnambula; Flotow’s Martha; Gluck’s Orpheus and Eurydice; Gounod’s Faust and Romeo and Juliet; Mascagni’s Cavalleria rusticana; Meyerbeer’s Dinorah and Les Huguenots; Mozart’s Don Giovanni; Thomas’s Mignon; and Verdi’s Aida, Otello, and Rigoletto. The final offering of the residency on December 12 was a fourth performance of Lohengrin, and changes in the cast included Valero in the title role, Albani as Elsa, and Vinché as Heinrich; Louis Saar conducted. Two days later on December 14, the company was back in New York for the Metropolitan Opera’s season opening: Gounod’s Romeo and Juliet featuring Eames and the de Reske brothers with Vianesi on the podium. 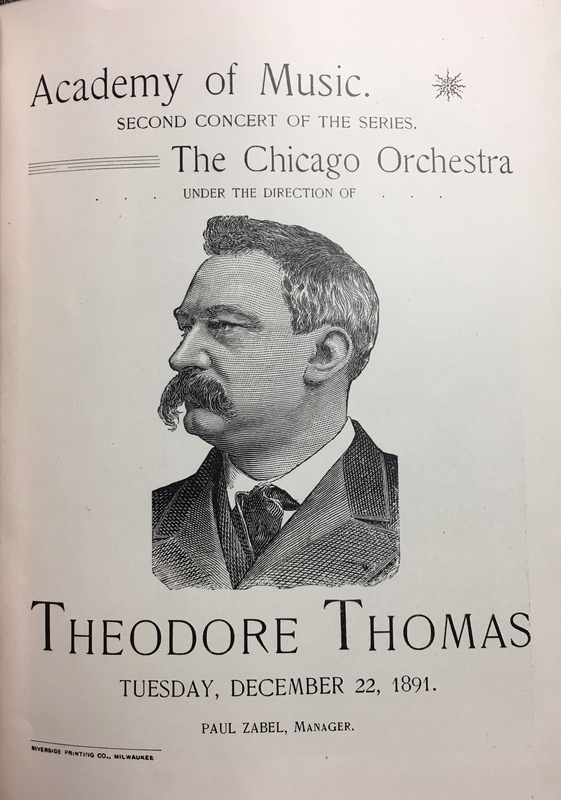 After two run-out performances on December 15 (at the Odeon in Cincinnati) and 16 (in Indianapolis), founder and first music director Theodore Thomas and his Chicago Orchestra resumed the regular season with the fourth subscription week at the Auditorium on December 18. An abbreviated version of this article appears in the program book for the December 14, 15, 16, and 19, 2017, CSO concerts led by Jaap van Zweden. Special thanks to our colleagues at the Metropolitan Opera and their performance history database. 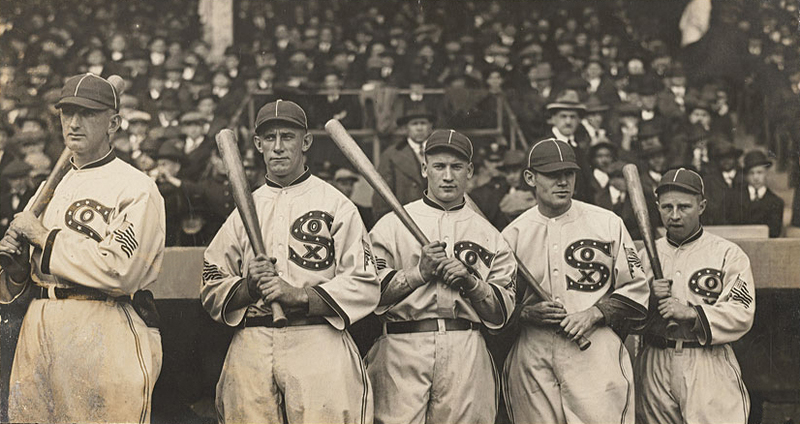 During the Chicago Orchestra’s first decade, the ensemble frequently performed in the pit when the Metropolitan Opera’s touring company traveled through the Midwest. 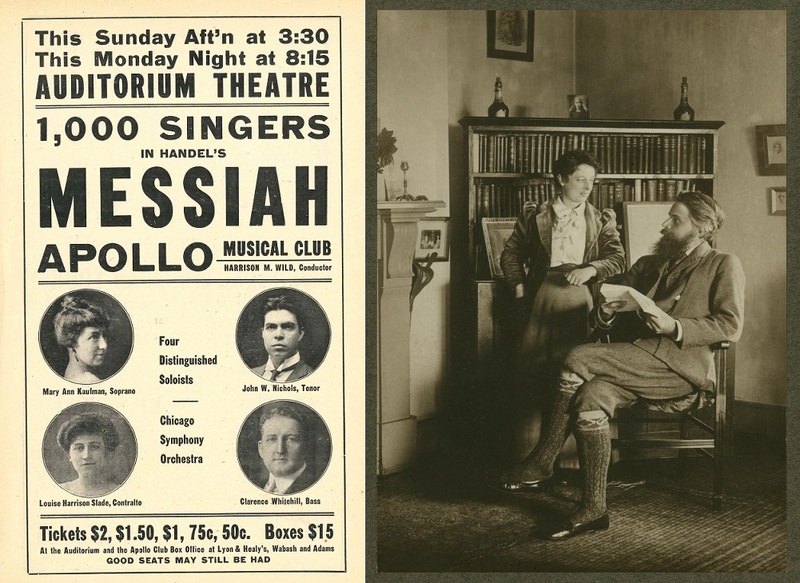 One of the most extensive residencies during that era occurred during the 1896-97 season, when the Met collaborated with the Orchestra over a six-week period—from February 22 through April 3, 1897—spending four weeks in the Auditorium Theatre followed by a two-week tour to Saint Louis, Louisville, and Cincinnati. Together they gave over forty performances of fifteen different operas, including Bizet’s Carmen; Flotow’s Martha; Gounod’s Faust, Philemon and Baucis, and Romeo and Juliet; Mascagni’s Cavalleria rusticana; Massenet’s Le Cid; Meyerbeer’s L’Africaine and Les Huguenots; Mozart’s Don Giovanni; Verdi’s Aida and Il trovatore; and Wagner’s Lohengrin, Siegfried, and Tristan and Isolde. 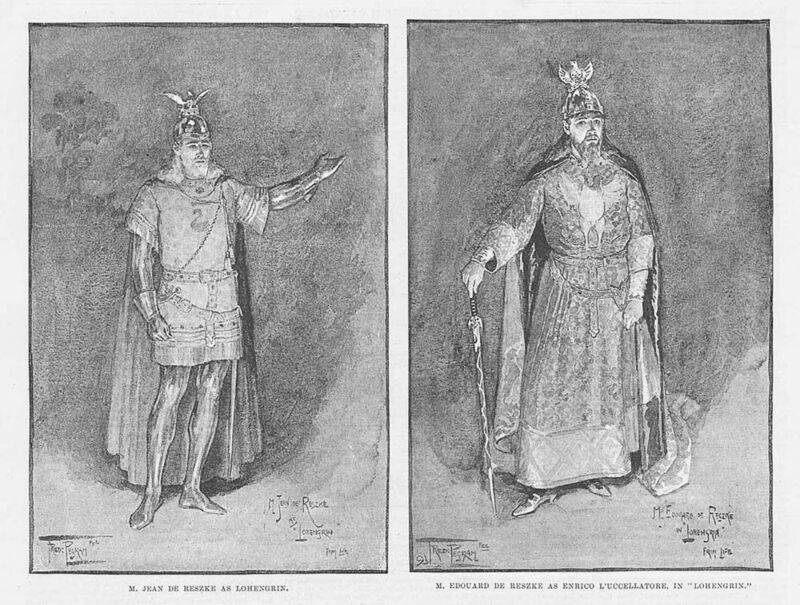 The touring company included some of the most important singers of the day, many performing multiple roles, including: Emma Calvé as Carmen, Marguerite, and Santuzza; Jean de Reszke as Don José, Faust, Lohengrin, Siegfried, and Tristan; and his brother Édouard de Reszke as King Marke, Leporello, Mephistopheles, Ramfis, and the Wanderer. 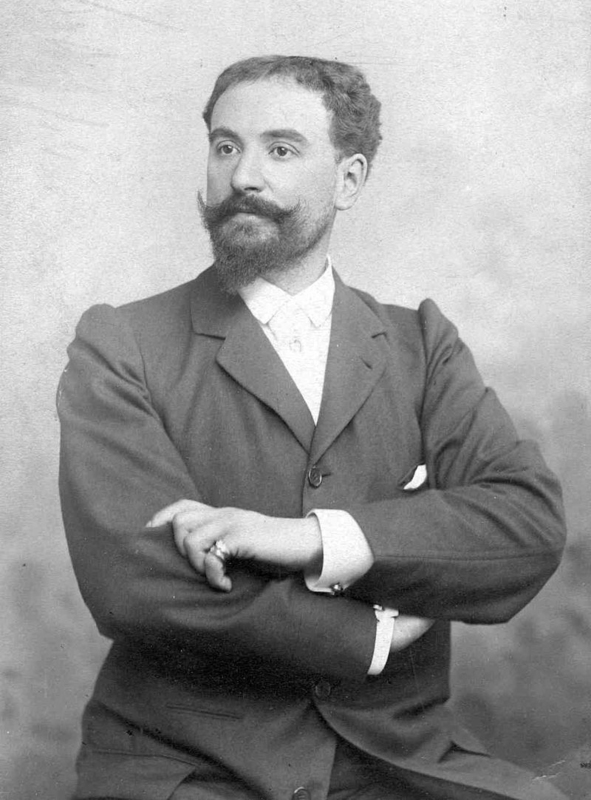 Other singers included Mathilde Bauermeister, David Bispham, Giuseppe Campanari, Félia Litvinne, and Eugenia Mantelli, among many others, and Metropolitan Opera house conductors were Enrico Bevignani, Luigi Mancinelli, Louis Saar, and Anton Seidl. 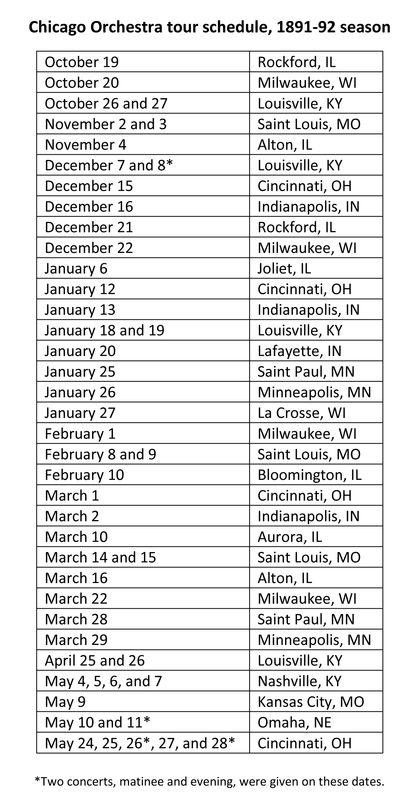 For more details on the Metropolitan Opera’s Chicago residencies, check out the company’s performance history database. Riccardo Muti leads the Chicago Symphony Orchestra and Chorus, Chicago Children’s Choir, and bass Riccardo Zanellato in the Prologue to Boito’s Mefistofele on June 22, 23, 24, and 25, 2017.